From the acclaimed, bestselling author of Stardust, The Good German, and Los Alamos—a gripping tale of an American undercover agent in 1945 Istanbul who descends into the murky cat-and-mouse world of compromise and betrayal that will come to define the entire post-war era. Played out against the bazaars and mosques and faded mansions of this knowing, ancient Ottoman city, Leon's attempt to save one life leads to a desperate manhunt and a maze of shifting loyalties that threatens his own. How do you do the right thing when there are only bad choices to make? 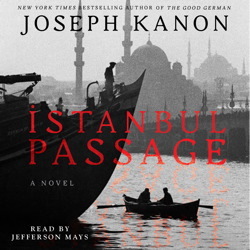 Istanbul Passage is the story of a man swept up in the aftermath of war, an unexpected love affair, and a city as deceptive as the calm surface waters of the Bosphorus that divides it. Rich with atmosphere and period detail, Joseph Kanon’s latest novel flawlessly blends fact and fiction into a haunting thriller about the dawn of the Cold War, once again proving why Kanon has been hailed as the “heir apparent to Graham Greene” (The Boston Globe). the plot and story was great but the delivery / narration was inadequate and stifling which was a distraction.